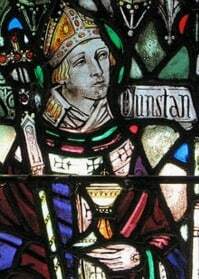 Dunstan (909 – 19 May 988) was an abbot of Glastonbury Abbey, a bishop of Worcester, a bishop of London, and an archbishop of Canterbury, later canonized as a saint. His work restored monastic life in England and reformed the English Church. His 11th-century biographer, Osbern, himself an artist and scribe, states that Dunstan was skilled in “making a picture and forming letters,” as were other clergy of his age who reached senior rank. Another story relates how Dunstan nailed a horseshoe to the Devil’s hoof when he was asked to re-shoe the Devil’s horse. 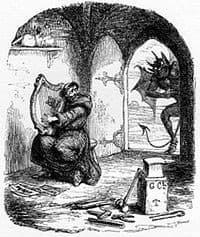 This caused the Devil great pain, and Dunstan only agreed to remove the shoe and release the Devil after he promised never to enter a place where a horseshoe is over the door. This is claimed as the origin of the lucky horseshoe. There is an interesting, detailed Wikipedia article on St. Dunstan, which can be read here.